TYNKSIL QS REPAIR is a very high quality decorative, pigmented plaster coating based on silicone resins with specially selected mineral fillers, pigments, modifiers and reinforcement microfibres. It features great decorative value, vapour permeability, it is hydrophobic and has a high resistance to weather. Thanks to the small grain size (0.5 mm), this silicon plaster coating is intended for making thin-film, decorative interior and external plaster coatings on substrates made of cement, cement-lime, concrete mortar and adhesive mortar SYNTEKOL PSW, SYNTEKOL Q4, POROLIT Q4. 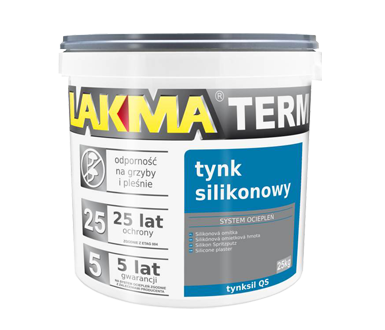 This product is particularly recommended for use as a renovation finishing layer on the existing structural plasters which have deteriorated naturally over the years. It is ideal as the final decorative layer and protective coating during the renovation of townhouses.